The need for equal access to and equal treatment of women and men when using economic and financial resources or information, in education and training. Policies in this area focus on the elimination of barriers that women face to accessing, for example, the rights to own their own land in Kyrgyzstan, microcredit loans in Albania, and information regarding financial management and the basics of market economics in Uzbekistan. The central role that promoting equal pay, a gender-sensitive work environment, and equitable opportunities for advancement play in eliminating the gender pay gap. 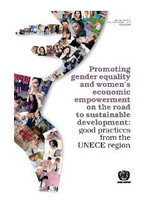 Strategies highlighted to reduce gender inequalities in the workplace target the wage differentials that remain a persistent challenge in the UNECE region. For example, countries such as Denmark and Germany have offered positive incentives for private companies to identify gender differences in their wage structures and take actions to close the gender pay gap, whereas countries such as Portugal have enacted new Labour Codes that enforce equal pay guidelines with monetary fines. The way in which micro and small enterprises (many of which are run by women) are supported is an important tool to create new opportunities for women to generate income and new sustainable patterns of production of goods and services. Programmatic responses to address ubiquitous issues in the region such as the need for networking opportunities and support systems for women entrepreneurs, as well as the need for specialized knowledge and skills trainings are highlighted. The importance of increasing the proportion of women in top-down administrative decision-making positions in the region as a key pathway to women’s empowerment. Several gender quota schemes implemented in the public (Poland, Norway) and private (Netherlands, Denmark) sector are presented as well as an example of an international coalition to increase women’s decision-making power at the community level in the area of climate change. The need for facilitating a balance between work and family life as a means to overcome women’s persistently disadvantaged position in the labour market.